Okay, so admittedly that title is kind of obvious. There aren't a whole lot of people out there who are going to deny that the thing we all want in life, or at least one of the things we want very much, is friends. But I'm not talking here about nice people who you can get coffee with once every few months and whose pictures you usually like on Facebook. I'm talking about how, deep down, we all seem to really long for transformational friendships. For the kind of friendships where you're a little bit in love with them all, where you can't just not imagine your life without them, but you can't imagine who you would be without them. In, like, a good way. Well, that's actually worth mentioning: these friendships can be good or bad. That drive inside us to find lifelong companions can also lead us to invest in toxic relationships that ultimately hurt us a lot more than they give us joy. The fear of being lonely can lead us to do some really unhealthy crap. But I'm not really talking about the bad kind of transformational friendships today. No, I want to talk about the good kind. 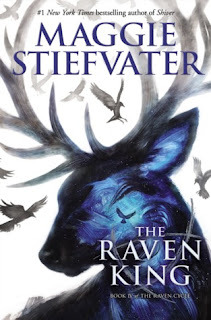 Before I go any further though, I have to cop to something: I've actually talked about friendship and this series, The Raven Cycle by Maggie Stiefvater, before. Almost exactly a year ago, in fact. And while I don't disagree with anything I said in that article, I was never really satisfied with it either. I never said all the things I was trying to. So I'm going to take a stab at it, and maybe I won't get it all out this time either, but I'll be closer at least. Today we're talking about The Raven King, fourth and final book in The Raven Cycle, and how it gets at the core of what we all really really want. We want friends. I've talked about this a lot before, actually, especially in relation to how this concept is at the core of the popularity of the Fast and Furious movies (a theory that I stand by), but it's the kind of topic that never really gets old. We are human and we are social and we desire friends. It's that simple. And then again, like I said before, it's also not that simple, because I know for me it's never quite been enough to just have some friends and hang out every weeks and chat about our lives or have the odd deep conversation late at night. That's never left me satisfied. Instead, I find myself desperately wanting more, going too fast or too hard into friendships, or else finding my heart wandering elsewhere where I think I'll get the souldeep transformation I desire. When I have found these kinds of friendships, they just make me hold even more tightly onto them because they're totally that good and worth holding onto. Because when you find these friends, these soulmate level, ride or die, feels like you were fated to meet friends, you feel completely known, good and bad, on a level you weren't entirely aware was possible. It's scary and exhilarating and worth it. Blue Sargent is a normal girl living in a normal town with her normal family. Well, if by "normal girl" you mean "girl who is prophesied to kill her true love with a kiss", and "normal town" means "homing beacon for the weirdest magical crap this side of the Mississippi", and "normal family" is taken as "matriarchal society of psychics". If you take those meanings as read, then Blue Sargent is completely normal. The series starts with Raven Boys, where Blue is befriended (begrudgingly on her part) by a couple of boys from the private school in town, Aglionby Academy. The boys are on a magical quest to wake an ancient Welsh king from his magical slumber, and they're pretty sure he's sleeping somewhere on the ley line that runs through Henrietta, their town. Blue falls head over heels for her friendship with them, intoxicated with the joy of being one of the pack, of their quirks and complexities, and the sensation of knowing exactly who she is when she's with them. It's easy to see why she likes it. The first book is largely about the boys and Blue discovering the breadth of the mysteries in Henrietta. They don't find the Welsh king, they don't really discover much of anything at all (aside from this one really really big twist), and it mostly sets the stage for the rest of the story, but it's a good beginning. Because as much of a simple setup book as Raven Boys is, it's also a book that shows you precisely how all of these characters in the friendship need to be transformed. It's as much about getting the breadth of their personalities and flaws as it is getting the breadth of the story, and that means that by the time we get to book two, we are in. We are invested. These are our kids and we love them. Or at least that's how it was for me. I really like this series. 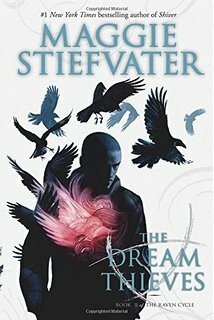 The second book, Dream Thieves, goes in a slightly different direction, exploring how far the bonds that have formed between these characters can be pushed before they break. It's still about deep deep friendship, but now it's exploring what it's like for those friendships to slip a little, to falter at their first big challenges. Every character has come out of Raven Boys altered (some very literally, like scholarship student Adam, who struggles with his abusive family even while making a deal with a magical forest to be its eyes and hands), and Dream Thieves is about their attempts to figure out what their new states mean for their friendships as a whole. I suppose it's also worth mentioning that each book is really about one character in particular, though not always the character you expect it to be. Raven Boys is about Adam, or maybe Blue, but probably Adam. Dream Thieves is about Ronan, the prototypical bad boy who is secretly an incredibly powerful magical being who can dream things into reality but who still struggles with his anger issues and his unrequited (sort of) feelings for Adam. Blue Lily, Lily Blue is about Blue, or about Adam, but probably Blue. 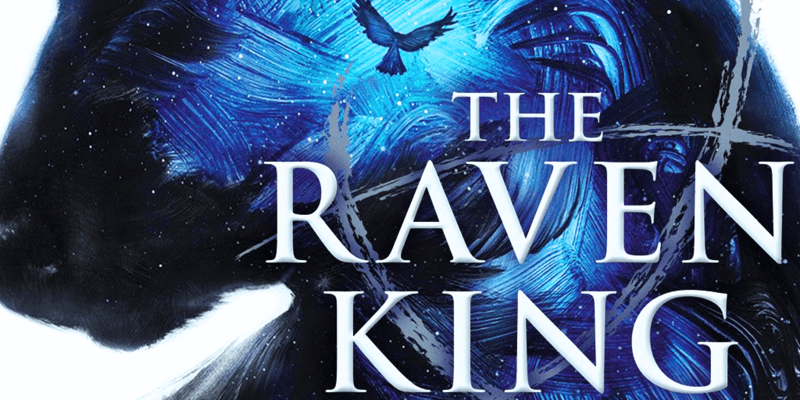 And The Raven King is utterly Gansey's book, a whole volume devoted to the rich kid, king in the making, destined to die, effortlessly charming and also obnoxious figure who binds all the other characters together. Anyway. Dream Thieves stretches the friendship and Blue Lily, Lily Blue tests it. 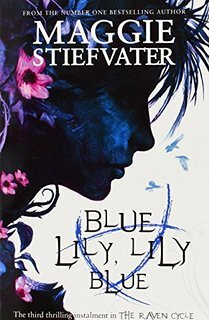 By this point all the characters have grown into their new powers and understandings of themselves, but they're still trying to piece themselves back together in the new context, and Blue Lily, Lily Blue is about them working to be the kind of friends they know they're supposed to be. It's also about them failing a fair bit and getting it wrong and fighting and still desperately loving each other. Which, when you get down to it, is a big part of why I love these books. Yes, they're about transformational friendships and love (platonic) that can last a lifetime and the kind of people you go to war for, but they also don't mince words about how annoying those people can be sometimes. Like, you can love someone and not be able to even imagine who you would be without them and still want to punch them in the face for popping their gum while you're trying to concentrate. I appreciate Maggie Stiefvater for acknowledging both sides of that. Transformational relationships might be magical and amazing and important, but they're also like any other kind of relationship in that they require a lot of work and a lot of patience to get through to the wonderful bits. The Raven King, then, is where these friends fall back together like piano keys lining up for a perfect chord. It's where everyone is finally who they are supposed to be, where all the prophecies come true (but never how you think), and where they finally find and wake that magical king sleeping on the ley line, but it's definitely not how you expect. The books have a lot going on in them, but the core is always the friendships, the relationships, the way that these four characters fall into and out of each other. They're about how the people you meet can radically change what you expected from yourself in wonderful and glorious ways, but also how you have to take responsibility for the way you change them in return. They're good books and if you haven't already, you should definitely read them. So that's the secret of what we all want, at least according to me. I think we all want friends. I think we all want to be known, to have the feeling that we have been seen down to our very marrow and the person who saw us isn't judging or condemning what's in there, just seeing it and loving us anyway. I think we all want a friendship that's like falling in love but simpler, just the desire to be the person this person already thinks you can be. I know I want that. I've had it and I want it still. More. Again. There's this Nietzsche quote I love (yes, how horribly pretentious of me) that I think gets to the heart of what I'm saying here: "But all joy wants eternity, wants deep, deep, deep eternity! "* I think this is fundamentally true. When we desire friendship that transforms us, friendship that penetrates to the soul, what we're really looking for is a relationship that feels eternal. You know, one of those friendships that doesn't feel like it ever really started and doesn't feel like it could ever really end. You still have to work to keep it up, because those friendships are like any other and can fizzle out or fall to pieces, but it's got that brush of magic to it. It's a little taste of eternity in another person. Aw hell, I've gotten all sappy here. Well, at least it's in a good cause. Look, I think friendship is woefully underappreciated in our society, and I think it's time we changed that. It's time we pushed back against that idea that friendship is somehow less than romantic and familial love. It's not less, it's just different. And it's beautiful for what it is. The Raven King is about a friendship where everyone in it would die for everyone else in it, but more importantly where they would all live for each other and help each other live. I call it transformational friendship because by the end of this series, all our heroes are radically different than they were when they started. But not just different, they are more themselves. They have been seen and known and tested and loved, and in the end they're so much more the people they always were. That's the kind of friendship I think we're all after, and it's fantastic to see it articulated so clearly. 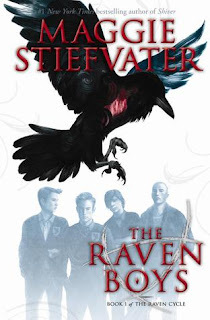 I think in the end what I want to say is really just this: The Raven Cycle gives us the shape of what friendship can look like, and without that shape it's really hard to find it on our own. I love these books mostly because I love reading them and I fell a little in love with all the characters along the way, but I also love them for putting words to the longing I already had. For helping me map out the hunger in my heart for friends who will make me more me. It might be horribly pretentious and sappy and goopy to say it, but I like this series because it gives me a picture of what it can mean to be loved, and I needed that. So read The Raven Cycle. Read The Raven King. And look for the people who will follow you into a dark tunnel in the middle of the night to look for a Welsh king who's been dead for hundreds of years. I promise you they're out there, and they're worth finding. *It's from Thus Spoke Zarathustra, and the whole poem is really amazing and worth looking up.